Cadence 0.9.0 has just been tagged in its git repository. No new features have been added to the code-base. The release is focused on the Qt5 port, and of course the fixes that have been added over time. Qt4 is no longer supported; the code was updated to work with Qt5, without having a fallback Qt4 mode (unlike Carla). Cadence Qt5 port is needed for a proper KXStudio 18.04 release, as we will be using KDE5 Plasma as desktop environment. The KXStudio "Welcome" wizard has also been ported to Qt5. This finalizes the Qt4 => Qt5 porting process, with all KXStudio tools now running in Qt5. In other news, the preparations for KXStudio's 18.04 ISO release have started. The decision is to use Neon as the base distro for the next ISO images, with Breezy-Dark as default theme. The KXStudio configuration files have been ported from KDE4 to KDE5, with only a few tweaks missing now. Note that Ubuntu 18.04 (and thus Neon 18.04) is not out yet, so a release will of course have to wait for them first. We will have beta images first, to let users test and give feedback. When everything seems to run fine, and I am happy with the results, the final image will released. > Carla 2.0 beta6 is here! Hello again everyone, I am glad to bring you the 6th beta of the upcoming Carla 2.0 release. This should be the last beta for the 2.0 series, as next one is planned to be release candidate 1. There were quite some changes under the hood, mostly in a good way. The trade-off for users is that this means losing some features, the biggest ones being VST3 and AU plugin support. The way audio and MIDI devices are handled on Windows and macOS also changed, no longer having dynamic MIDI ports. See the previous post about Carla to get more details on the "breaking changes". But let's move on with the good stuff! Previous releases of Carla had basic time controls already, but it was quite basic and lacked options for JACK transport and BPM control. Now JACK transport is optional, transport works for non-JACK drivers and BPM can be adjusted manually. Ableton Link support was added in was well, as another way to sync transport. It was not extensively tested though. Also note that, due to compiler support, the current Carla macOS builds do not support Link. Transport can misbehave when rolling back or forwards, so this feature is still classified as experimental. The plan is to have transport stabilized when the final 2.0 version is released. 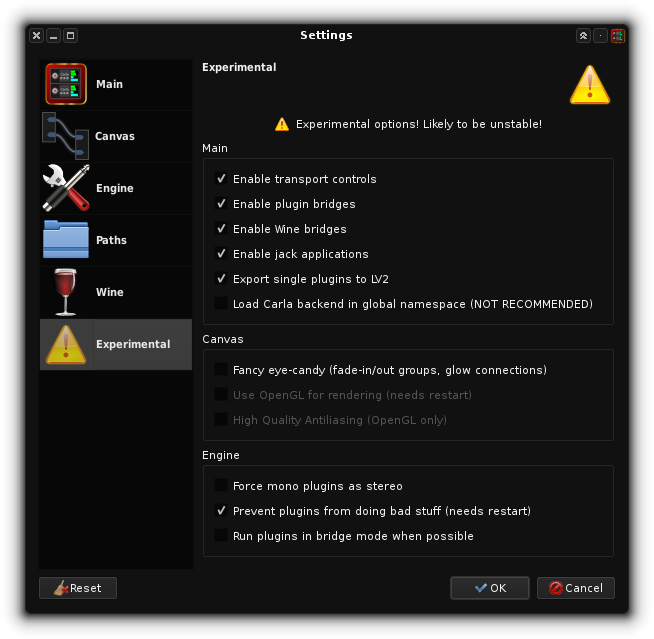 Carla's settings dialog received an overhaul. Everything that was deemed unstable was moved into a new 'experimental' page, and disabled by default. So in order to use plugin bridges for example, you need to first enable experimental features, then the bridges. The (experimental) features mentioned on this article all have to be enabled in the same way too. Last but not least, a page dedicated to Wine settings (wine-prefix, wine startup binary, RT variables) was added. Initially just an idea that became an ugly hack/test for private use only, I soon realized it had great potential. So I split the code used for plugin bridges and made it more generic so it could be re-used for such features. And here we have it, JACK applications running as regular plugins inside Carla - including showing/hiding their main interface. Applications also receive JACK transport as rolling in the host. In this mode Carla basically becomes a self-contained JACK server, and exposes a special libjack to the client. The client connects to Carla believing it's actually connecting to "JACK", as Carla implements libjack API through its plugin bridge mechanism. 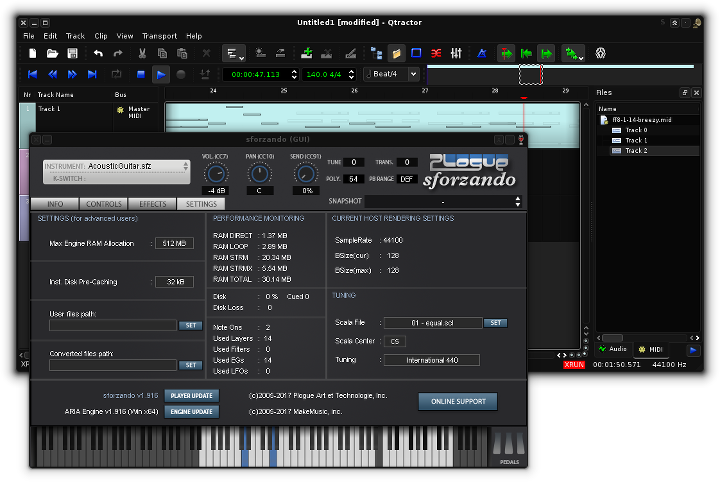 Within Carla you first define a fixed number of audio and midi ports at the start. Ports are allocated dynamically on the plugin side, but get mixed down at the end to the number of outputs selected. This is a nice workaround against clients that dynamically register their ports, sometimes with random names too. With Carla jack-apps-as-plugins method, the client ports are persistent. The full libjack API is not implemented though, only the important parts, in order to get most applications running. The most notable missing calls are related precise timing information and non-callback based processing. Also no session management is implemented at the moment. But, even without this, stuff like audacity, lmms, hydrogen, renoise and vlc work. This is a work in progress, but already working quite well considering how new it is. Another big feature of this release is the possibility to export any plugin or sound file loaded in Carla as its own self-contained (LV2) plugin. This can really be any regular plugin, a sound bank (e.g. an SFZ file), a plugin bridge or even JACK application. The exported plugin will run with the smallest amount of wrapping possible between the host and the carla loaded plugin. Carla will not appear at all, triggering the "show ui" on the host will show the actual plugin UI. 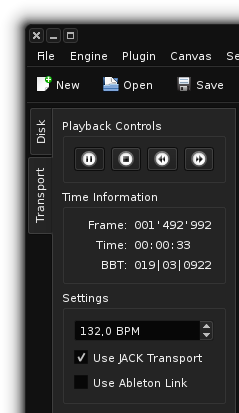 Audio, MIDI, transport information, custom UI are fully working already. The only missing feature at the moment is LV2 state, which needs to map to DSSI configures, VST chunks and other stuff. Although working for non-Linux systems, this was not tested. Testing of this feature in general is very appreciated. After the removal of the juce library from the code-base (as discussed before), Carla was free to support more than just the big 3 OSes. With the help of the community, Carla is now available to install on FreeBSD through its ports system. It's also now possible to build Carla for GNU/Hurd and HaikuOS as well, and I imagine for even more systems if one so desires. If this is something you're interested in and need some help, let me know. Carla as plugin and Carla-Control are still not available for Windows, likely won't be done for v2.0. To download Carla binaries or source code, jump on over to the KXStudio downloads section. If you're using the KXStudio repositories, you can simply install "carla-git" (plus "carla-lv2" and "carla-vst" if you're so inclined). Bug reports and feature requests are welcome! Jump on over to the Carla's Github project page for those. A few days ago a new version of JACK2 was released. You can grab the latest release source code at https://github.com/jackaudio/jack2/releases. If you did not know already, I am now maintaining JACK2 (and also JACK1). The release was actually already tagged on the git repo quite some time ago, but I was waiting to see if Windows builds were possible. There are still no updated macOS or Windows builds, but I did not want to delay the release further because of it. The 1.9.11 release (without RC label) was skipped to avoid confusion with the versions. So 1.9.12 is the latest release as of today. macOS and Windows binaries still use an older 1.9.11 version. Being the maintainer of both JACK1 and JACK2 means I can (more or less) decide the future of JACK. I believe a lot of people are interested to know the current plan. First, JACK1 is in bug-fix mode only. I want to keep it as the go-to reference implementation of JACK, but not add any new features to it. The reason for this is to try to get JACK1 and JACK2 to share as much code as possible. 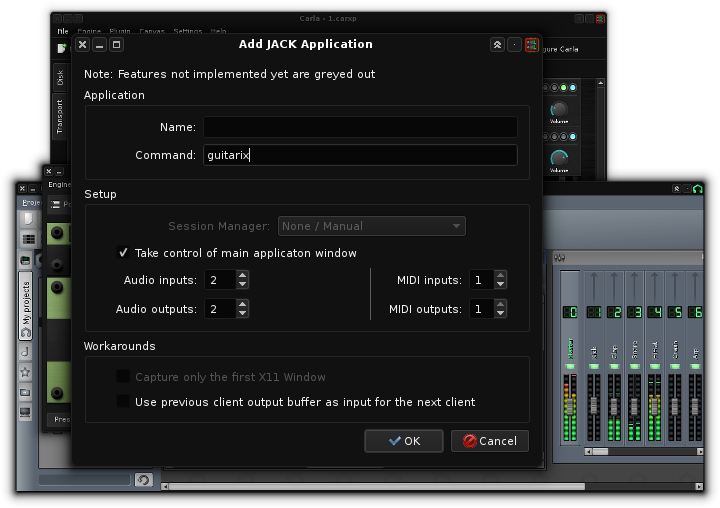 Currently JACK2 includes its own copy of JACK headers, examples and utilities, while JACK1 uses sub-repositories. During the course of next year (that is, 2018) I want to get JACK2 to slowly use the same stuff JACK1 does, then switch to use the same repositories as submodules like JACK1 does. This will reduce the differences between the 2 implementations, and make it a lot easier to contribute to the examples and utilities provided by JACK. We will keep JACK1 "frozen" until this is all done. Second, but not least important, is to get the JACK1 specific features into JACK2. A few things were added into JACK1 after JACk2 was created, that never made it into JACK2. This includes meta-data (JACK2 does have the API, but a non-functional one) and the new internal clients. The purpose is to reduce reasons users might have to switch/decide between JACK1 and JACK2. JACK2 should have all features that JACK1 has, so that most users choose JACK2. Now, you are probably getting the impression that the focus will be on JACK2, which is correct. Though I realize some developers might prefer JACK1's design, the long "battle" of JACK1 and JACK2 needs to stop. Development of new features will happen in the JACK2 codebase, and JACK1 will slowly become legacy. Well, this is my personal plan at least. Not sure if this all can be done in 2018, but better to take things slowly and get things done than do nothing at all. I will keep you updated on the progress through-out the year. Hello everyone, I have some bad and good news about Carla. If you've been following the development on the git repository you likely know what this is about. There were some major changes done to Carla's code base in the past few days. The biggest change is the removal of the Juce library. The reasons for this are well known by some developers, but I'll not write about them here. After looking around for alternatives, I decided to fork an older GPLv2 compatible version of Juce and strip it down to the really essential parts needed to get Carla to build and run - even if it meant losing some of the features. The possibility to change to an entirely different C++ framework crossed my mind, but the amount of effort and breaking changes would be too big. The implications for this change are not big for Linux users, and is even a source of good news for other OpenSource Operating System users like FreeBSD and HaikuOS. In short, because Juce is no longer there, we have lost support for VST3 and AudioUnit plugins. Plus VST2 plugins on Windows and MacOS are now handled by Carla's code instead of relying on Juce. This heavily reduces the amount of compatible plugins handled by Carla, because Juce had a lot of hacks in order to make a lot of commercial plugins run properly. 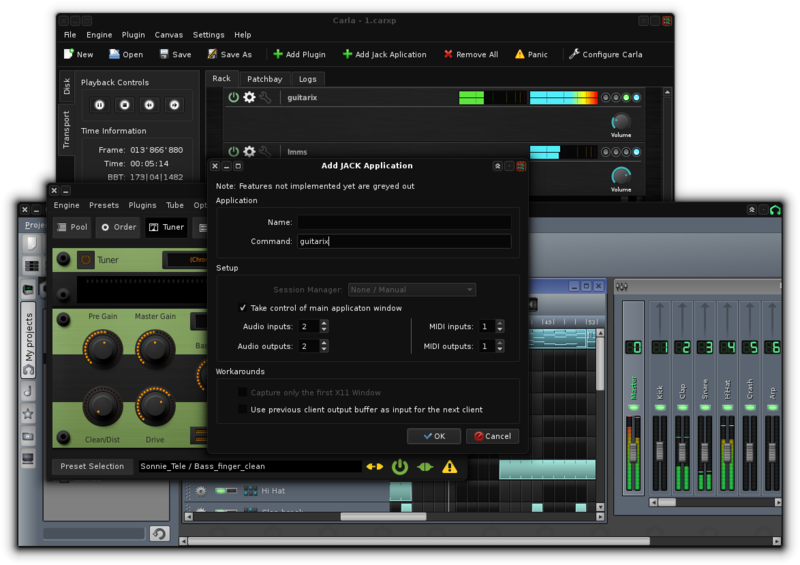 Also Carla on Windows and MacOS used Juce to handle Audio and MIDI devices, which now has been changed to RtAudio and RtMidi. RtAudio & RtMidi are not as fully-featured as Juce was (we lose dynamic MIDI ports, for example), but I am glad to have Juce gone from the code-base. The next breaking change relates to the internal plugins used in Carla. The plugins that already exist as LV2 will stop being exported with the carla.lv2 bundle. Plus these plugins will soon be removed from the default build. They quickly bloat the Carla binaries, as they include their artwork. Not to mention increasing the clone and building times. The plan is to have them disabled by default and moved into a new repository as submodule. Oh and the "experimental" plugins are going away soon. It was a mistake to make them Carla-specific in the first place, they should be regular audio plugins instead. Another breaking change is the removal of modgui support. The code only worked for PyQt4, which is no longer the default for Carla source-based builds. Plus it required webkit, which brings a big list of dependencies. I would have to port the code to webengine/chromium to make it work with PyQt5... no thanks. The final breaking change is the introduction of the Experimental option in Carla's settings. All new in-development / testing features will get introduced as experimental first. This will speed up the release of 2.0, since not everything needs to be finished for it. For example, plugin bridges can still be there and not fully implemented, and we still have 2.0-stable out! That's it! Thanks for reading so far. In other news, I gave a small presentation about Carla in this year's Sonoj Conference. With some minor things finally done and all reported bugs squashed, it's time to tag a new release of DPF-Plugins. The initial 1.0 version was not really advertised/publicized before, as there were still a few things I wanted done first - but they were already usable as-is. The base framework used by these plugins (DPF) will get some deep changes soon, so better to have this release out now. I will not write a changelog here, it was just many small changes here and there for all the plugins since v1.0. The source code plus Linux, macOS and Windows binaries can be downloaded at https://github.com/DISTRHO/DPF-Plugins/releases/tag/v1.1. The plugins are released as LADSPA, DSSI, LV2, VST2 and JACK standalone. The order shown is more or less the order in which they were made. Note that most plugins here were made/ported as a learning exercise, so not everything is new. Many thanks to António Saraiva for the design of some of these interfaces! This is a collection of small but useful plugins, based on the good old LOSER-Dev Plugins. This collection currently includes 3 Band EQ, 3 Band Splitter and Ping Pong Pan. Its release was intended to provide a practical demonstration of Dattorro’s figure-of-eight reverb structure and provide the open source community with a high quality reverb. This is a DPF'ied build of the original MVerb plugin, allowing a proper Linux version with UI. Simple single-oscillator synth based on the Roland TB-303. Simple karplus-strong plucked string synth. This is a DPF'ied build of the karplong DSSI example synth, written by Chris Cannam. It implements the basic Karplus-Strong plucked-string synthesis algorithm (Kevin Karplus & Alex Strong, "Digital Synthesis of Plucked-String and Drum Timbres", Computer Music Journal 1983). DPF'ied ports of some plugins from Niall Moody. See http://www.niallmoody.com/ndcplugs/plugins.htm for the original author's page. This collection currently includes Amplitude Imposer, Cycle Shifter and Soul Force plugins. projectM is an awesome music visualizer. 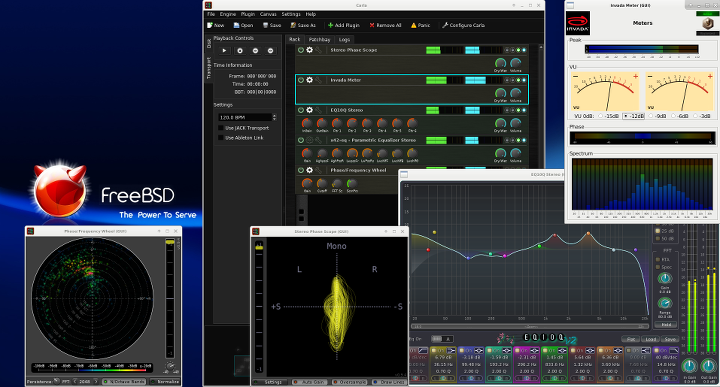 This plugin makes it work as an audio plugin (LV2 and VST). This is an OpenGL bars visualization plugin (as seen in XMMS and XBMC/Kodi). Adapted from the jack_glbars project by Nedko Arnaudov.